P.A.I. Personal Accident Insurance for driver and passengers. No additional charges for the second driver. This island played a very important role throughout Greek history. It was the first area in Greece which developed advanced civilisation, the famous Minoan Civilisation. Even in these days visitors experience the historical atmosphere of Crete, as you can find monuments and traces of foreign civilisations scattered all over the island. Crete has a people noted for and conspicuous in their hospitality and tradition of welcoming visitors. The traditions and culture offered in music, art, food and crafts play a large part in this picture. It combines European ways with the uniquely local.Because Crete is the largest of the Greek islands, it offers both developed tourist areas with resort hotels and also quiet coves, hidden beaches and invigorating mountain villages and plateaus that reward the discerning world traveller. Wondrous moments, those memorable combinations of time & place that provide you with enriching experiences, are yours - here - if you explore the island. Heraklion is the capital of Crete, its larger urban centre and the economical centre of the island. It offers all the possible touristy facilities and activities and an exciting nightlife. 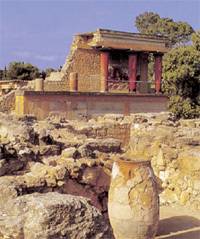 Many archaeological sites can be visited in Heraklion as well as beautiful churches. Concerning culture and entertainment, Heraklion is particularly rich, especially in summer when cultural events are organized all around the city. With our customer service which is available 24/7, "Eurodriver" offers low cost quality car rental that does not reduce quality. Hire a car in Crete with Eurodriver � the low cost, online car hire specialist. We provide cheap rental facilities in Crete. Car hire Crete gives you the opportunity to investigate the hidden surprises of this fascinating island. Our great variety of cars and bikes can satisfy any desire that you have and any road that you might take. Eurodriver car hire Crete, Heraklion airport, Heraklion, Chania, Chania airport, Rethymno, Agios Nikolaos, Malia, Georgioupolis,Stalis,Elounda offers low priced car rental rates for varying periods. Check our offers for hire a car in Crete and explore the magic island! Find the ideal place to stay in the island of Crete and rent the most suitable vehicle for you to explore the island. Our company's headoffice is situated in Heraklion and there are also two more offices in Stalis and Malia. All the cars and bikes of EuroDriver are in very good condition and can be replaced , in case of an unexpected problem. We provide high quality services in the rental of cars and bikes. We also ensure that our customers receive a clean, well kept, well maintained, reliable car with all the extra equipment requested. We are always, on time and at the place that the vehicle has been agreed to be delivered. With the highest level of insurance coverage we protect our clients and fleet. Our professional assistance by well trained personnel ensures trouble free rental and high standard after sales care. Our rates include - full insurance covers all damage - insurance against theft - full personal insurance for the passenger - unlimited mileage - road maps - useful informations - free delivery & collection - road assistance all over the island.Our car and bike rental prices are low while at the same time include a variety of car & bike rental services.